We all can’t have Mark Wahlberg‘s home gym.My current home gym is approximately 7 feet by 4 feet. That’s how much space I have in my home office to try out a new core exercise or pushup variation I might be writing about and trying to describe for an article or book. Equipment? I have a pair of bands in my gym bag and some dumbbells in the basement, but I rarely use them. You may think that’s a weird thing to admit for a guy whose name is on a book called The Home Workout Bible, and who regularly writes sections on home exercise in workout books. But it’s simple enough: Since I work at home, the last thing I want to do is work out at home. Some weeks I wouldn’t get out of the house at all if it weren’t for those trips to the gym. The gym, though, isn’t for everybody. Based on the email I get I’d say it isn’t for up to half of the readers of the New Rules of Lifting Series, the five books I wrote with Alwyn Cosgrove. So I’ve gotten pretty good at explaining what you do and don’t need to create a home gym. I started lifting in 1970 when I was 13. My older brother had just been cut from the freshman football team at an all-boys Catholic school, and he wanted to make sure it never happened again. He took the garlic-infused money he’d made waiting tables in a local Italian restaurant and bought an 110-pound weight set at Sears. It included a 10-pound standard barbell (the kind with a 1-inch-thick bar), a couple of dumbbell handles, and 90 pounds of weight plates: 6 tens, 4 fives, and 4 two and a half’s. A couple years later we added a bench, a second weight set, and a pair of 25-pound plates. The equipment, for all I know, is still around somewhere. Our younger brothers were using it long after my older brother and I moved out. That’s the beauty of a home gym: the basic stuff, like all those plastic bottles in landfills, will still be around long after you’re dead. Your gym membership, meanwhile, only lasts until you miss a couple of payments. So let’s talk about what you need to get started, what to add on when you can afford it, and what you can do with a variety of equipment options. Let’s say you’re the 2013 version of my brother and me. You have the budget for one piece of equipment. Your easiest and most useful option is to buy an Olympic barbell set, the kind that’s 2 inches wide at the ends. A basic 300-pound set will give you a 45-pound bar, 255 pounds in weight plates, and a pair of collars to hold the weights in place. I’m sure with a more thorough search (45 seconds, say), including local second-hand stores, yard sales, and Craigslist ads, you can find something much cheaper. We’re just talking about inert hunks of metal. Unless the bar’s bent, secondhand weights should still allow you to get first-rate results. So what you can do with a barbell? In addition, you can still mix and match dozens of body-weight exercises, including pushups, squats and lunges, and core exercises. The push-up variations, in particular, give you great choices for working your chest, shoulders, and triceps. The barbell is an inflexible, unforgiving training tool. The shoulders are probably at greatest risk, thanks to bench and shoulder presses. 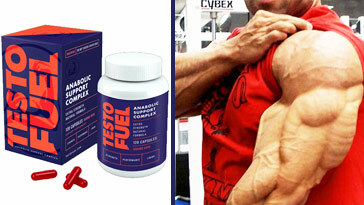 But the elbows can take a beating when doing biceps curls and French presses (an overhead triceps extension). Barbell squats can punish the knee joints, while others complain of back pain from deadlifts. Those who don’t suffer any of those injuries wonder what the complainers are doing wrong, while those who do tend to divide lifters into two groups: those who are already hurt, and those who soon will be. It’s not that simple. The injury mechanisms are theoretical. They remain mysterious even to those I’ve talked to who understand them best. 1. Don’t do anything that hurts while you’re doing it. 2. If you develop an injury, suddenly or over time, respect it. Give yourself plenty of time to recover, and then give yourself, even more, time to regain whatever strength you lost. 3. If you suffer more than one injury from the same exercise, move on. That exercise clearly isn’t for you. *For more in information check out SpotMeBro’s in-depth guide to power racks. A much better choice is a power rack. While the bench-press station allows you to do one exercise, a power rack allows you to start with the bar at shoulder level for front squats, back squats, or heavy shoulder presses. You can start with the bar elevated to knee level (more or less) for rack pulls and floor presses. You can also use it for bench presses if you have a basic bench without uprights. You can slide it into the rack and configure the supports to hold the bar wherever you need it. And that’s just the beginning. A power rack should also have a horizontal support across the top for pull-ups and chin-ups, assuming you’re set up in a room with enough overhead clearance for those exercises. Whether you do or don’t have the headroom, you can set up your barbell inside the rack for inverted rows, one of the best and most versatile upper-back exercises for lifters trying to build strength for chin-ups. An inverted row is like a pushup in reverse. You hang from the bar with your weight resting on your heels and your body straight. You can use an overhand grip for overall back development, or an underhand grip to work your biceps more. All that is still just a fraction of what you can do with a basic power rack. If you have a suspension system, like the TRX, you can attach that to the chin-up bar. Now you can do any of the dozens of exercises you’ll find on YouTube or the TRX website: pushup and row variations, lunges and squats, and more core exercises than any of us could fit into a year’s worth of training. But wait, there’s more! Add a few bands, using any part of the rack as an anchor point, and now you have yet another set of options, replicating just about anything you’d do with a cable system in a commercial gym. And we’re still not finished. 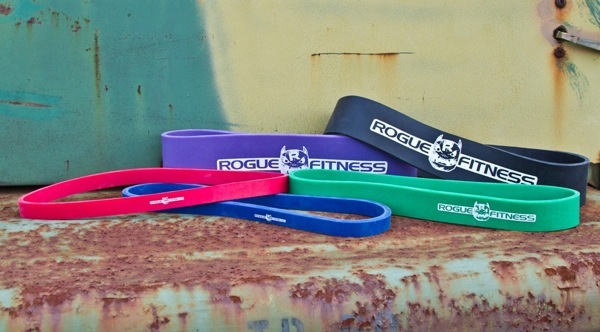 The weight plates themselves offer a few more options. You can hold them at chest level for goblet squats and lunges, or use them for lateral raises, or grip two at a time to develop hand and wrist strength. 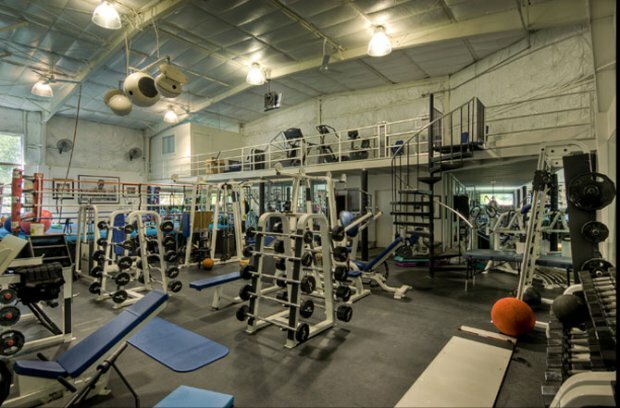 You now have a pretty sweet home gym. The setup I just described takes up a lot of space. The Olympic bar is 7 feet long, and you want at least a foot of clearance at either end. You can get shorter Olympic bars, but they’re typically more than $100, and I’ve never seen one offered as part of a package deal with weight plates. 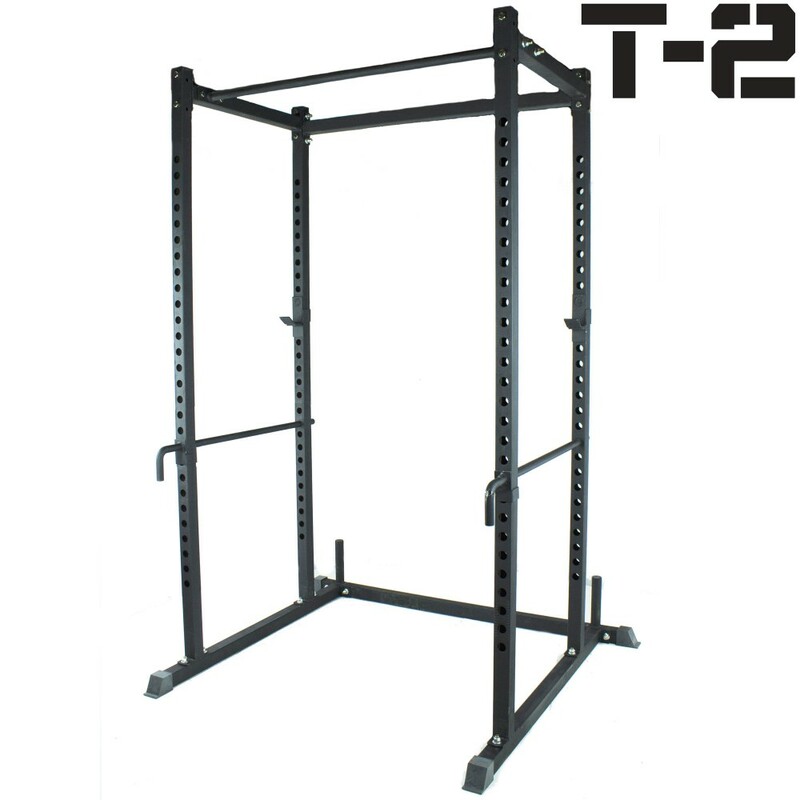 The squat rack is 7 feet high, which will be a pretty snug fit in most basements, leaving you no room for chin-ups. It also has a footprint of about 20 square feet. If you’re using it an anchor for a suspension system, you’ll need even more open space in front of the rack. 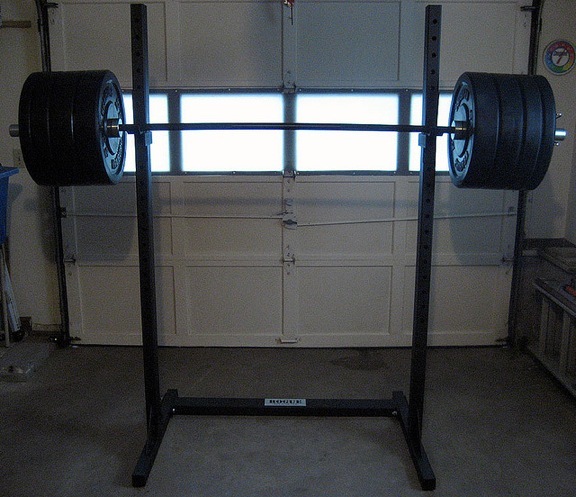 Squat stands are a space-saving option because, unlike a power rack, they can be moved aside when not in use. You can raise them for squats and lower them for bench presses and inverted rows. But you lose the other benefits of a power rack. When you have the room and do most of your lifting with a barbell anyway, this setup could allow productive workouts for years. You can easily add more weight plates as you outgrow the original 255 pounds. If that’s for you, great. If not, there’s another way to approach it. The biggest advantage of dumbbells over a barbell is that they allow your arms to rotate and to operate independently of each other. That’s a more natural way for them to operate, and in theory, should lower your injury risk. I can lift much more aggressively with dumbbells, with no discomfort at all, which is why I rarely do barbell chest or shoulder presses. The versatility of dumbbells is apparent with just this snapshot. That’s why the fitness magazines frequently show all-dumbbell workouts, and why programs like P90X are so popular. But the limitations of dumbbells are also obvious, especially with those first two lower-body exercises. The goblet squat is a fantastic movement. It might be the single best lower-body exercise for inexperienced lifters. But the stronger you get, the bigger the dumbbell you’ll have to hold in front of your chest, and the more awkward and difficult it’ll be. Same with the sumo deadlift—or, really, any heavy lift from the floor. Within a year of training with a barbell, you can probably deadlift the equivalent of your body weight. How do you replicate that with a dumbbell? Before I try to answer that question, let’s look at your equipment options. I’ll start with a quick trip back to my formative years when my brother and I worked out with those cheap, plastic-coated weights in our parents’ basement. Each of our weight sets came with a couple of dumbbell handles. One had collars that you tightened with a wrench. The weights stayed in place, but changing them was laborious, time-consuming, and even bloody if we weren’t careful with the wrench. Some years later I bought a set of threaded dumbbell handles. 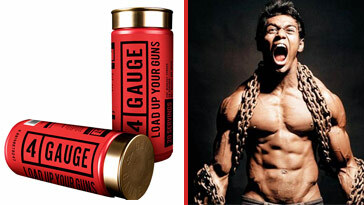 With a couple of spins of the collars, you could change weights in seconds. Problem was, the damned collars didn’t stay spun, forcing me to cut sets short or risk having plates slip off the handle and crash to the floor. 1. 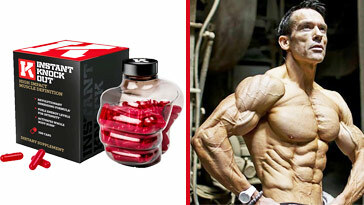 Buy individual dumbbell pairs. Easy to understand: Figure out the lightest and heaviest weights you need, and everything in between. Then buy a pair of each. 2. 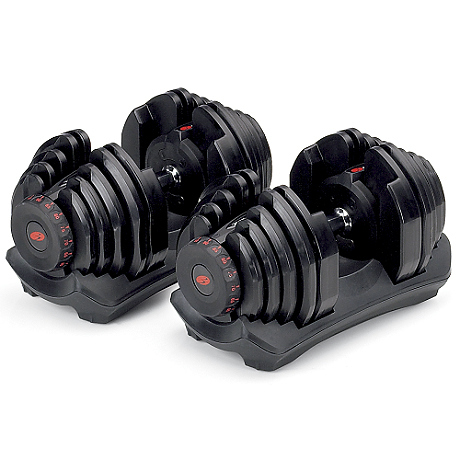 Buy a set of adjustable dumbbells. 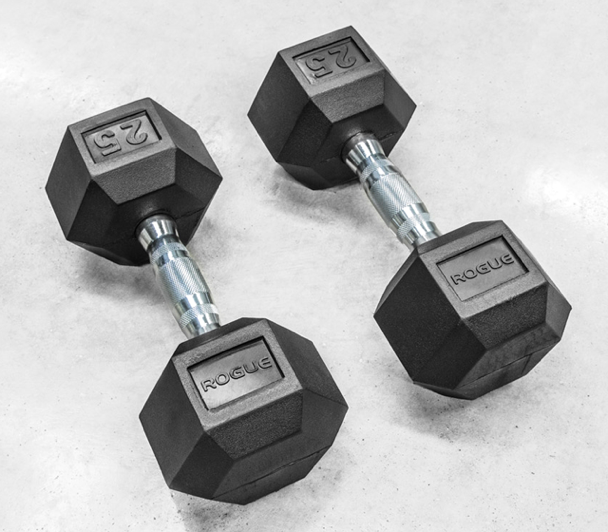 You get a pair of high-tech dumbbells that start at 5 or 10 pounds and go up 90, These sets take up the space of a single pair. 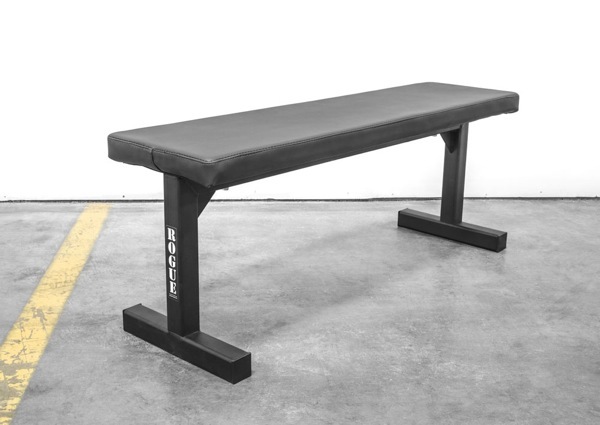 Add a bench and you have something pretty close to a complete home gym, especially for upper-body exercises. I certainly wouldn’t need more than 90 pounds per side for any rowing or pressing exercise. But how do you solve the lower-body problem? One option is to flip the weights up and rest them on your shoulders for squats. You’re only limited by how good you are with the dumbbell clean. Two 50-pound dumbbells balanced on your shoulders will feel a lot heavier than a 100-pound barbell. The other is to heed the wise words of Mike Boyle and focus on split-stance exercises. The rear-foot-elevated split squat (best known as the Bulgarian split squat) works with two weights held at arm’s length or a single weight held goblet style. Step-ups to a box or bench will also hit the major lower-body muscles. So will any number of lunge variations. 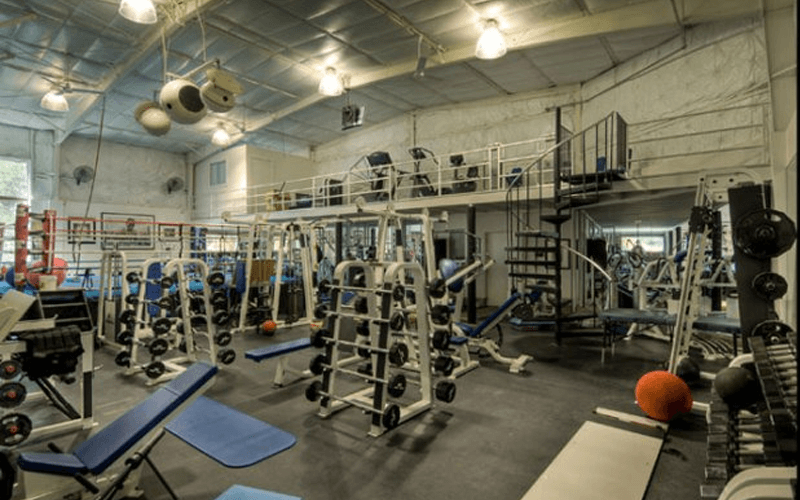 If you’re starting a home gym from scratch, what’s your best choice? In a perfect world, you’d go for a combination: an Olympic barbell set and power rack for heavy squats and deadlifts, with a bench and adjustable dumbbells for most of your upper-body exercises. But that’s probably unrealistic for most. A serious lifter would want the Olympic barbell option, with a power rack and a bench. Someone with no physical limitations would be able to do the best exercises for strength and size: squats, deadlifts, and presses (with the understanding that you can’t push your 1RM on the bench press or squat without a spotter), along with chin-ups and inverted rows. 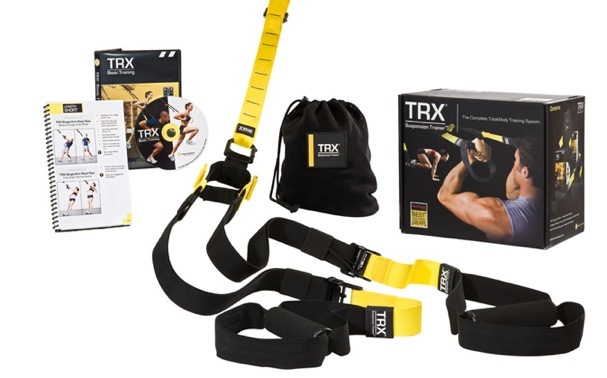 Add a TRX and you now have a lifetime’s worth of challenging options for core and metabolic training. Go for adjustable dumbbells and a bench. You can hide your entire home gym in a corner of your living room. You’ll be able to push yourself to the limit on upper-body exercises, at least until you’re no longer challenged by 90-pound bench presses and one-arm rows. Lower-body training will employ a lot of split-stance and single-leg exercises, but your muscle development shouldn’t suffer if you’re willing to push yourself. I’ve had shoulder problems off and on since I was a teenager, and my knees are so bad I can no longer squat with anything close to my body weight. But I don’t have any problem with chin-ups or inverted rows. I’d miss my heavy deadlifts—the only power lift I can do with challenging weights. To make up for it, I would use some combination of single-leg Romanian deadlifts, hip thrusts with a dumbbell, and hip extension/leg curl combos with the TRX. I’d be able to do chin-ups with the power rack and inverted rows with the TRX. I could live with all those choices. 1. 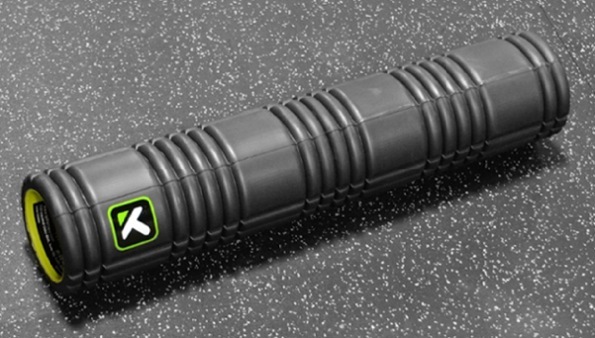 Foam roller – I use one at the start of every workout, I’d include one in a home gym. 2. 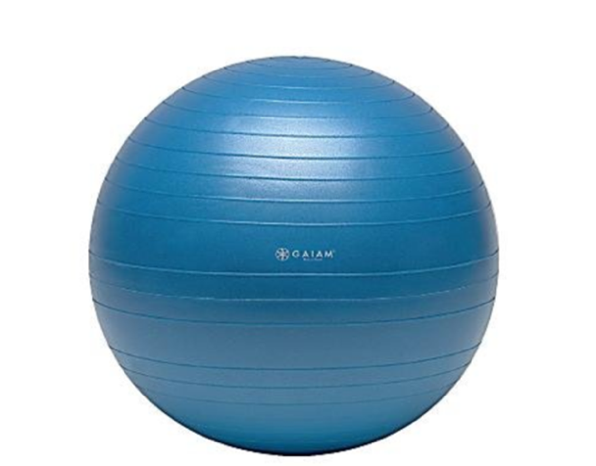 Swiss ball – I don’t use one much anymore, but if I didn’t have a suspension trainer in a home gym I’d want the ball to add an element of instability to my core training. 3. Hex bar – If I had the Olympic barbell set up, eventually I’d consider adding a hex bar.